Parrot-type tulips are by far some of the most flamboyantly lovely flowers in the garden. With their exotic form, bold colors and striking designs, they are more than just your average spring-blooming plant. Our new Amazing Parrot is no exception! With vibrant dark rose-red petals edged in vivid yellow-orange, they are perfect for adding brilliancy and interest to the landscape. When planted in large groups, it makes an impressive display along a sunlit walkway, in a seasonal border or mixed cutting garden. Plant alongside traditional tulips in hues of white or yellow for remarkable contrast. 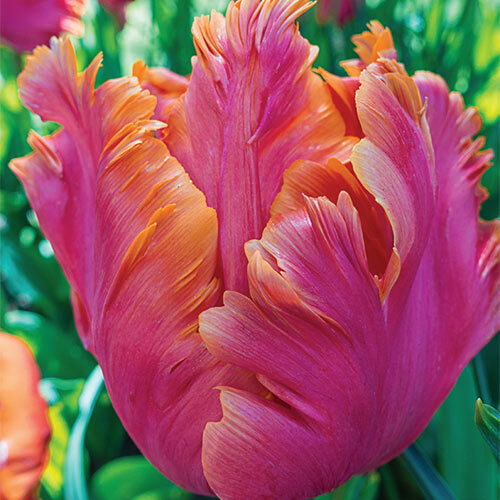 Parrot tulips are tolerant of many soil types and are easy to grow and maintain.